The kids will have hours of fun with this pack of 100 colourful plastic playballs. 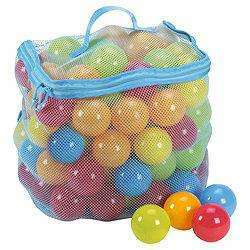 The multi-coloured plastic playballs are ideal for use in ball pits or for games in the garden or the beach. They are supplied in a handy reusable carry bag with handle. Suitable for all ages. You'll have hours of fun with this pack of 100 colourful plastic playballs. The multi-coloured plastic playballs are ideal for use in ball pits or for games in the garden or on the beach. Brilliant price, we have a few packs of these and same as pp get played with by my 1 and 9 yr olds alot. Tesco's balls are bigger and so is the pit but I suppose 400 would be appropriate. I got my balls today and the pit. I set everything up and put my balls into the pit. It was a little over half full with 400 balls. I put the little one in and it seems reasonable. The box says that the pit goes great with 100 balls! I reckon about 600 to fill it properly - to the brim that is. I got my balls today and the pit. I set everything up and put my balls … I got my balls today and the pit. I set everything up and put my balls into the pit. It was a little over half full with 400 balls. I put the little one in and it seems reasonable. The box says that the pit goes great with 100 balls! I reckon about 600 to fill it properly - to the brim that is.